Stora Enso is launching their Modular & Volumetric Building System in London today. Welcome drinks will be served from 6.00 pm and followed by short presentations and a panel discussion looking at typical design and engineering methods for Modular and Volumetric building and relevant case studies. Presentations will be followed by a drinks & canapés in the Gallery. The guest speakers at the launch event are Paul Williamson, Managing Director of Modular Construction at Swan Homes, who will share Swan’s vision for the future of modular construction in the UK and Anssi Lassila, Founder and Director of OOPEAA Office for Peripheral Architecture, based in Helsinki and Seinäjoki, who will discuss the innovative Puukuokka Housing Block which was completed in 2015 using Stora Enso Modular CLT units. Panel discussion will include guests from Ramboll and Pollard Thomas Edwards Architects. Stora Enso is a leading provider of renewable solutions. Their aim is to replace non-renewable materials by innovating and developing new products and services based on wood and other renewable materials. The Group has some 26 000 employees in more than 35 countries, and is publicly traded in Helsinki and Stockholm. Please note: Places are limited. A separate registration must be completed for each guest here. Wood Architecture Conference in Tallin is organized for the tenth time this year. It brings together top architects and engineers from around the world who have stood out with innovative use of wood in their works. Wood is sustainable, lightweight, strong and easily manufactured material. Wood is a very traditional construction material. However, it is also one of the most innovative construction materials today. Using wood is a challenge to both architects and engineers. The conference seeks answers to such important topics as acoustics and fire safety in timber buildings, the use of long span wooden structures, CLT solutions, wooden facades, etc. The Annual Wood Architecture Award ceremony takes place during the conference. The conference is organized by Estonian Association of Architects, Estonian Association of Construction Engineers, Estonian Association of Forest Industries, and Wood Information. The speakers at the conference include Stefan Mannerwitz from Karakusevic Carson Architects, Dave Lomax from Waugh Thistleton Architects, and Timothy Snelson from Arup, all based in London, and Martin Vahtra from Projects Design Associates based in New York, Rainer Strauch from Cree Gmbh in Germany as well as Sten Ader from SKAD Architects and Sille Pihlak & Siim Tuksam from PART, both from Estonia. Wolfgang Winter is from the Vienna University of Technology, Austria, Richard Harris from the University of Bath, UK, Eero Tuhkanen from the Tallin Technical University, Estonia, and Rait Pukk from the Estonian Academy of Security Sciences. The National Wood Architecture Day in Finland provides a meeting ground for hundreds of professionals in the field of architecture and building industries interested in the research and development regarding all aspects of the use of wood in architecture and construction. There are two sessions running in parallel throughout the day with presentations on current themes of topical interest in the field of wood architecture in Finland and beyond. The National Wood Architecture Day is organized by Wood Information. This year the international presenters include Patrick Thurston from Switzerland, Helmut Spiehs of Binderholz Bausysteme from Germany, Liam Dewar of Eurban Limited from London, Sandra Frank of Folkhem from Sweden, and Stefan Mannewitz of Karakusevic Carson Architects from London. The program in Helsinki concludes with the award ceremony for the Wood Architecture Award. Puukuokka Housing Block, Part One by Anssi Lassila / OOPEAA was selected the winner of the award in 2015. The Periscope Tower by Anssi Lassila / OOPEAA was nominated for a candidate for the Wood Architecture Award this year. The Nordic Built – Sustainable Transformation and Environmental Design, STED is a three year long project with the aim of developing new tools for the use of Life Cycle Analysis (LCA) as a way to evaluate the sustainability of architectural design projects from the early design stages on. aim is to develop innovative and generalizable system design solutions and design methods to create sustainable buildings. The project was initiated by the Technical University of Denmark DTU in 2015 and it is now reaching its mid point. Selected architecture offices with a focus on research and development as part of their practice from each of the five Nordic counties were invited to take part in the project: Tegnestuen Vandkunsten from Denmark, Helen & Hard Arkitekter from Norway, White Arkitekter in Sweden, Studio Granda from Iceland, and OOPEAA from Finland. The project is coordinated by the Technical University of Denmark DTU and it is funded by a Nordic Innovation grant. The project consortium consists of four research institutions in the Nordic countries: DTU and Kunstakademiets Arkitektskole KADK in Denmark, Norges Teknisk Naturvitenskapelige Universitet NTNU in Norway, and Chalmers Tekniska Universitet CTH in Sweden. The research group convenes this week in Reykjavik, Iceland, to discuss the findings of the research this far and to evaluate the progress of the joint project. Participation in the STED project is an important part of OOPEAA’s research and development in exploring the possibilities of the use of wood in architecture, particularly, but not limited to, in providing sustainable solutions in housing and construction. The goal is to develop new tools for assessing the lifecycle ecology of a project from the early design stages on to help determine the best possible solutions. Arabiazza(s) offers a vision to redevelop the historic Arabia block into a new urban district. The proposal was developed by a team led by Anssi Lassila and composed of OOPEAA working in collaboration with Lundén Architecture. Gehl Architects acted as an expert in matters of urban public space. Arabiazza(s) was developed for an invited competition organized by Varma Oy with the City of Helsinki and the Finnish Association of Architects, SAFA. Arabiazza(s) was one of the four projects selected for the 2nd stage of the two-stage competition. Arabiazza(s) takes the rich temporal layers of the urban fabric in the continuously evolving process of change in the city as its starting point. Through a series of four open public squares it creates an environment that supports a multiplicity of functions engaging a broad range of people from local residents of different ages to students of the two academic institutions in the area, to people working in the offices in the neighborhood to tourists and visitors staying at the hotel or simply coming by to enjoy the cultural offerings of the design center or the restaurants of the beer garden. Through a combination of new buildings, renovated old buildings and the preservation of protected historical landmark buildings, the goal is to create a sustainable urban environment that supports the long term development of a balanced neighborhood with a varied mix of people and a rich diversity of functions. By introducing a sequence of four open public squares supported with more sheltered indoor spaces that facilitate urban public life, the aim is to turn the block into one of the most interesting parts of the district and indeed the city. The goal is to create a vibrant neighbourhood in which the multiplicity and layering of different functions creates a framework for the diversity of urban life and forms a place that is alive at all times of the day and though the seasons in the Nordic climate. The construction of Puukuokka Two on site has started. The Puukuokka apartment complex is getting a new addition. Puukuokka Two will soon be making company to Puukuokka One which was completed in the spring of 2015. 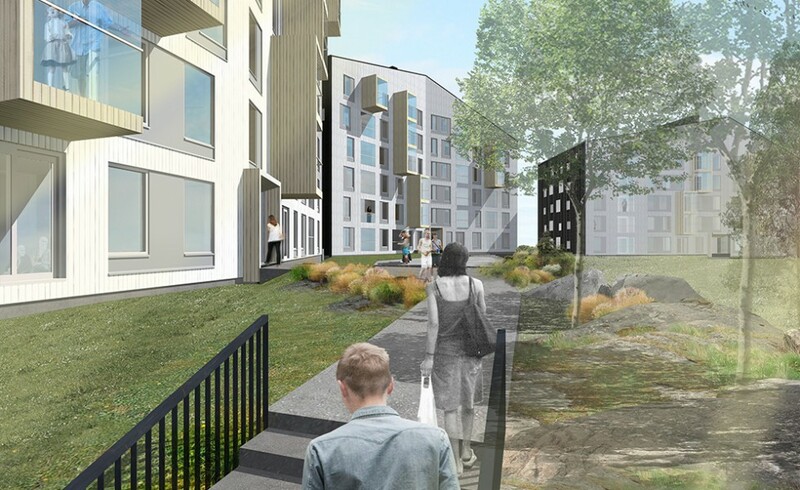 When completed, the Puukuokka wooden apartment block in the Kuokkala neighborhood in Jyväskylä will be composed of three wooden multi-story buildings. The on site construction of the second part of the trio, Puukuokka Two has now started. The expected date on completion for Puukuokka Two is set for spring 2017. Like Puukuokka One, Puukuokka Two will be composed of CLT. With a fully wooden load-bearing frame, the seven-story building will make use of the modular system developed when designing Puukuokka One. With slight modifications it will utilize the same principle of using prefabricated volumetric modules produced locally in Hartola just two hours away from the site. Each apartment unit will be composed of two prefabricated volumetric modules that are then plugged in onto the central hallway constructed on site. As in Puukuokka One, each apartment unit will feature its own sauna and a balcony. The sizes of the units will range from one-bedroom apartments to three-bedroom apartments. The façade materials will follow the concept of Puukuokka One with untreated larch on the side facing the interior courtyard and with dark coated spruce on the side facing the street. Puukuokka Two will contain 70 apartment units. The apartments are offered for private ownership using the lease-to-own model piloted in Puukuokka One. It allows the one to purchase the apartment with only 7 % downpayment and then gradually acquire full ownership through rental payments over a period of 20 years, with an option to sell the unit even prior to reaching the full 20 years. The lease-to-own model supports local sustainability through encouraging long term commitment to the building complex while offering within the block a variety of different types of units to correspond to the changing needs of the inhabitants in their life. Anssi Lassila of OOPEAA has been invited to give a lecture at the 6th Egurtek International Forum of Architecture and Construction in Wood in Bilbao. In is talk, he will discuss the potential of pre-manufactured CLT based modular construction to provide high quality homes that are environmentally responsible and affordable. The Puukuokka apartment building by OOPEAA will serve as an illustrative example of this potential. 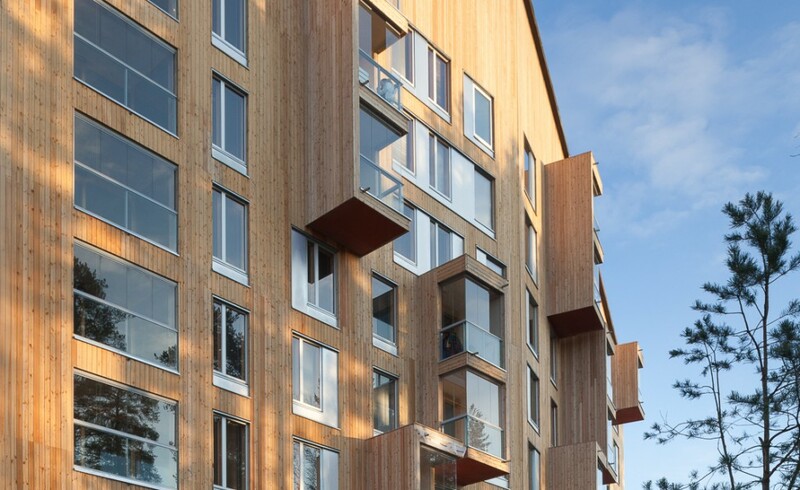 Completed in 2014 / 2015, it is the first 8-storey wooden apartment building in Finland. It is composed of volumetric CLT modules as the load bearing structure and has a fully wooden frame. Egurtek International Forum of Architecture and Construction in Wood is a forum for gathering information about timber architecture and construction. It is a biannual event and it is organized for the 6th time this year. The program features presentations by renowned architects from the Iberian Peninsula and abroad. Their addresses and talks provide an educational, visual presentation of the works that they have designed and built in wood. Egurtek has become an unmissable event for architects and engineers and all those professionals of the industry who have connections with wood. Through this Forum, more than fifty professionals of international prestige have presented their work and shared their experiences with all those attending the Forum. The Forum offers a conference program with first-rate international speakers. This year the speakers include Shigeru Ban, Michael Green, Mónica Rivera and Emiliano López, Tudor Radulescu, and Juri Troy, as well as Fernando Tabuenca and Fermín Leache, Gorka Elorza, and Jordi Fargas from the Spanish scene. For a full program and more information on the conference, click here. The American Architecture Prize honors designs in the disciplines of architecture, interior design, and landscape architecture with the goal of advancing the appreciation of architecture worldwide. Each submitted design was evaluated by the esteemed AAP Jury on its own merit based on form, function, and innovation. Winning projects were given titles of platinum, gold, silver, or bronze levels, along with honorable mentions from many distinguished submissions. The Periscope Tower by Anssi Lassila / OOPEAA was awarded silver in the category of Heritage Architecture. To review the entry, click here. The Suvela Chapel by Anssi Lassila / OOPEAA was awarded bronze in the category of Institutional Architecture. To review the entry, click here. The international list of jurors for the prize consists of a wide variety of professionals in architecture, journalism, interior design, art, and other related fields. For a complete list of the jury please click here. Browse all winners for the American Architecture Prize 2016 here. The Suvela Chapel in Espoo designed by OOPEAA was inaugurated on September 4, 2016. The Suvela chapel was commissioned by the Espoo Parish Union and it will be used jointly by the Espoo Paris Union, the Swedish Parish of Espoo and the City of Espoo to serve the entire community of Suvela. It is a multifunctional building that offers a space for the people of the community to use together for their many different needsregardless of their religious affiliation. OOPEAA embarked on the design and planning for the Suvela Chapel and the nearby community park in 2012. The goal was to create a building that has a strong identity of its own while also entering in dialogue with the multicultural context of this suburban neighborhood. With roughly one third of the inhabitants being of foreign descent, Suvela is one of the most multicultural districts in the Helsinki metropolitan region. Cultural diversity is both a rich potential and a challenge to the community. In the design for the Suvela Chapel and the adjacent community park, the goal was to create a building that offers opportunities for a rich variety of activities and provides a framework for the residents to come together in a flexibly adaptable and functional space. The chapel offers an approachable and welcoming space with a human scale and an inviting atmosphere. The building serves many functions providing a home base for many different kinds of organizations and serving as a dynamic place of activity. It is first and foremost a meeting place that serves members of the parish and other groups of people in the community alike. The local community park with its services is one of the three principal users of the building offering the children and their parents an opportunity to use the space in various ways. There is afternoon care for children after school as well as day care services for children. There are spaces for the youth as well as spaces for the various local community clubs to use for their activities. The building offers office space for the employees of the parish as well as for social workers and family services provided forhelping people in their various needs in their lives.A soup kitchen offering food for a very low cost is operating in the premises as well. The chapel naturally also serves as a place for mass, concerts, weddings, funerals, and baptisings. The location of the various functions in the different parts of the building is identifiable from the outside. While the height of the building varies greatly with the chapel hall as the tallest part, all functions are placed on just one level, and the building wraps into a single U-shaped entity forming an intimate interior courtyard in the middle. The belfry is embedded in the main building volume providing further closure to the yard. The different functions in the building orient themselves around the inner courtyard. The main entrance is placed in a corner where the U-shaped building opens to the courtyard, The main chapel hall with its auxiliary spaces is located in the north-east part of the builduing. Offices and work spaces of the parish staff as well as additional meeting and group work spaces are located in the middle part of the U-shaped volume. Spaces for children and the youth as well as spaces that are rented out to the city to serve the community park are located in the west part of the building. While the majority of the interior spaces face the yard, the spaces occupied by the community park face outward to the park. The building is a hybrid structure with wooden as well as concrete and steel elements. A tactile sense of material has a deliberately strong presence both in the interiors as well in the exterior of the building. The exterior shell is entirely clad in copper to emphasize the unity of the varied volume of the building. Copper was an ecological choice of material for the exterior. It is both durable and recyclable and therefore sustainable. It also ages well and acquires a beautiful patina over time. Local spruce is the material used in the interiors. In the spaces for the children’s activities, wood is present also in the outdoor canopies that provide shelter from rain giving the children an opportunity to play outside even in rainy weather. The presence of wood is most prominent in the tall chapel hall where the walls are covered with wooden scantlings. The Suvela Chapel has been nominated one of the four final candidates for the Finlandia Prize in Architecture in 2016. This year, the winner of the Finlandia Prize for Architecture will be selected by Paavo Lipponen, former prime minister of Finland. The winner will be announced on October 13, 2016. In this talk Anssi Lassila will share his thoughts about the idea of the potential of the borderline. Hewill explore this idea through three projects of very different scales, one situated in a rural context of an open landscape, one serving to provide us a view over the landscape in a suburban context, and one offering the people of a multicultural community a common ground and a shared space for coming together. Architecture and Cities in Transition seminar (ACT) is the traditional main event of the Tampere Architecture Week. The theme for Tampere Design-and Architecture Week is “borders”. The theme is explored as spatial, visual and functional borders in architecture and urban design as well as borders in culture, science and government. The speakers of the seminar are Nikos Salingaros (University of Texas at San Antonio), Søren Nielsen (Vandkunsten), Sheila Sri Prakash (Shilpa Architects), Mari Vaattovaara (University of Helsinki), Anssi Lassila (OOPEAA) and Marco Casagrande (Casagrande Laboratory). The Finlandia Prize for Architecture was established in 2011 by SAFA, the Finnish Association of Architects. The Finlandia Prize for Architecture is awarded to a design or renovation design for an outstanding new building or building complex that has been completed within the past three years. The Prize promotes the appreciation of high-quality architecture and aims to highlight the importance of architecture in producing cultural value and increasing well-being. This year, the Finlandia Prize for Architecture winner will be selected by Paavo Lipponen, former prime minister of Finland. The shortlist of the four final candidates was created by a jury composed of four members: Pirjo Sanaksenaho, Professor of Building Design Aalto University and Director of SOTERA Research Institute, Sari Nieminen, Artist Professor, Eero Lunden, Founder and Director of Lunden Architecture, and Janne Pihlajaniemi, partner of m3 Architects and Professor of Architecture at Oulu University. Paula Huotelin, Secretary General of Safa, the Association of Finnish Architects served as the secretary of the jury. The chapel offers an inviting and welcoming atmosphere. It is a meeting place that serves members of the parish and other groups of people in the community alike. While the height of the building varies greatly with the chapel hall as the tallest part, all functions are placed on just one level, and the building wraps into a single U-shaped entity forming an intimate interior courtyard in the middle. The belfry is embedded in the main building volume providing further closure to the yard. The building is a hybrid structure with wooden as well as concrete and steel elements. The presence of wood is most prominent in the tall chapel hall where the walls are covered with wooden scantlings. The exterior shell is entirely clad in copper to emphasize the unity of the varied volume of the building. The Suvela Chapel will be inaugurated on September 4, 2016.